Located at 4203 N Park Avenue, St. Joan of Arc Community Garden is part of the St. Joan of Arc Church & School campus. Our garden is a Lilly partnership between the church, school, and members of the local community including grants from the Meridian-Kessler Neighborhood Association. It was established in the spring of 2009 with help from Keep Indianapolis Beautiful (KIB) and Lilly Corp. Day of Service. St. Joan of Arc Community Garden primarily serves the neighborhood by providing garden allotments to local gardeners who otherwise would not have the space. Neighbors and also students at the school grow plants to satisfy scientific study, basic curiosity, biblical reference, and personal consumption. Our gardeners range widely in age, interests, and ability. A little more than half of our raised beds are rented by families and individuals in the general neighborhood public, and the rest are either rented by families at St. Joan of Arc Church and School or used for educational purposes by teachers and students at St. Joan of Arc School. Many of our resident gardeners are attracted to the garden because they want to be part of a gardening community. Others are simply interested in growing healthy food in the garden because they either do not have enough sunlight in their own yard, do not have the space, or do not own the property where they live. 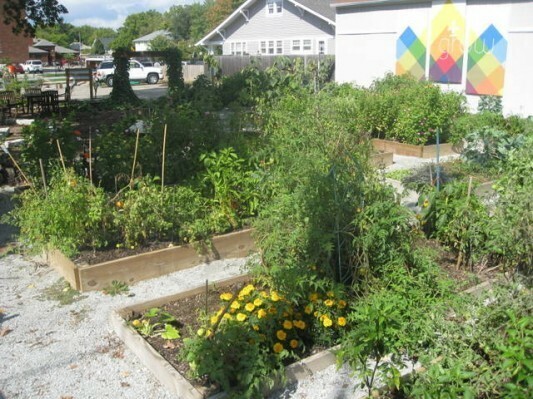 Throughout the growing season St. Joan of Arc Community Garden provides a natural meeting place for participating neighbors to join, to share, and to nurture not only a variety of skills and healthy edibles, but a stronger, more vibrant community as well. Volunteers have teamed to transform an unused and unsightly parking lot into a welcoming neighborhood garden. We have created a garden of our own design – one that meets both our needs and the needs of our neighborhood – a center of community life and a symbol of its vitality. The best way to get involved with SJOA Community Garden is to become one of our gardeners. Most of our raised beds are 4x12ft in length and currently rent for $24/year. We also have 3x8ft, 5x5ft, and 4x8ft beds, which rent for less. If you are a teacher at SJOA School, the use of a raised bed to educate students is free. All our allotments have been rented and are being used for the 2017 growing season, but contact one of the garden coordinators to be added to the waitlist.